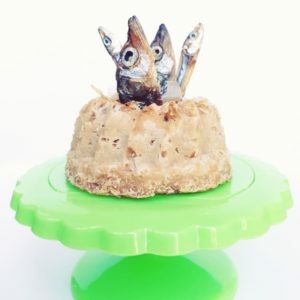 The Classic Pawty Cake is pawfect for your dog's next celebration! 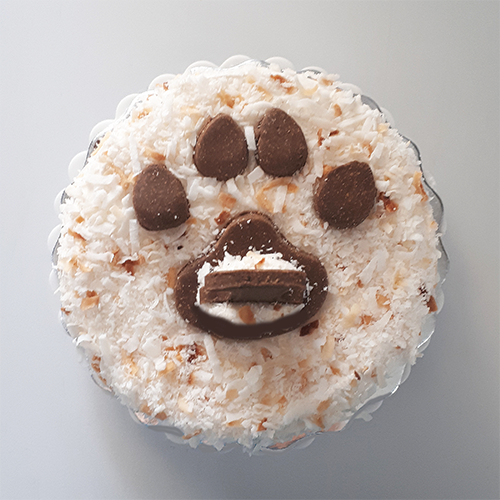 Our 4-inch, double layered cakes are topped with a carob dog paw cookie and adorned with little bones! 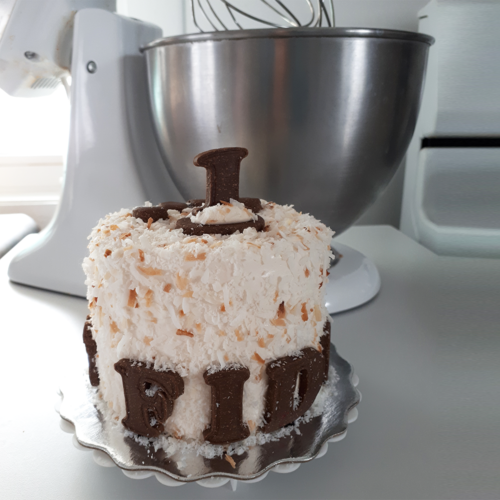 Whether it's your dog's birthday or you're celebrating an important milestone, this cake will be the icing on the top of your special day! Let's get your pawty started! because nothing would be more heart breaking than a pup left out at a pawty. dairy, egg, and dye free! The base of your cake will be made with organic chickpea flour and organic coconut oil, with the flavour of your dog's choice. was the best flour for our cakes and cookies for many reasons. all dogs to be included in your pawty and enjoy our desserts. calcium, magnesium, B vitamins, heart-healthy potassium, powerful antioxidant minerals, as well as iron and plenty of plant-based protein and fiber. low on the glycemic index, which means it won't spike your dog's blood sugar level as much as other flours, such as whole wheat and rice flour. Our flavours are fun, safe for sensitive tummies, and enjoyed by selective palates! The favorite treat of most dogs, peanut butter is the pawfect flavour for a pawty! To use it in its pure form, avoiding processed sugar and salt, we ground up our own organic peanuts and add only enough to your cake to create the flavour. Peanut butter is high in Vitamin E, Vitamin H, and heart-healthy fats. However, high fat could also mean stomach upset, so we limit the amount used by not including it in the frosting. but most don't know about the doggie-safe alternative, carob! dried, roasted, and then ground into a powder. Carob is less bitter than chocolate and has a roasted, naturally sweet flavor. It also happens to be caffeine-free and high in fiber. Now your dog can have a "chocolate" cake... and eat it too! naturally-coloured coconut sprinkles and the most labour intensive ingredient in the world, organic vanilla powder! which are commonly found in extracts. However, due to multiple tropical storms, this ingredient is in extremely low supply which makes it our most expensive ingredient. So grab our premium flavour while you can! A classic flavour that's made with organic carrots and Ceylon cinnamon. This "true" cinnamon has a sweeter, more delicate flavour. Also, compared to the common cassia cinnamon, it lacks the chemical called coumarin, which has been shown to be toxic to the liver and kidneys. Making this carrot cake the safest for your pup. Our delicious fluffy frosting is a homemade marshmallow, made with only organic gelatin and less than 3 tablespoons of organic honey. Traditional frosting for dog cakes typically include cream cheese, peanut butter, carob chips and/or starches like corn or tapioca. To stay true to our mission to be dairy and corn free, and to avoid excess oils and processed sugars, we had to find our own unique alternative. One day, our CEO asked if dogs could eat marshmallow and when we did the research, we found out that they can! So we created our own recipe that kept our frosting to two safe and hypoallergenic ingredients, organic raw honey, and organic gelatin! organic unsweetened toasted coconut sprinkles! *Who is the dog of honour? *Which flavour would your pup like? *Do you want your dog's name on the side of the cake? *Would you like a number cookie candle on top? *How old will your pup be? *What density would you like your cake? 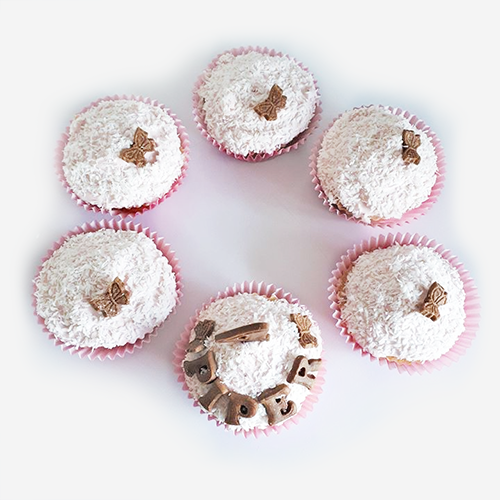 Pupcakes are made with the same delicious flavour as your cake and topped with a tiny carob bone! Order one for the dog of honour, their jealous sibling or pawty guests! *How many pupcakes do you need? We are located in Downtown Dartmouth at 21 Prince Albert Road, behind 27 Prince Albert Road. We're in the cream house with the blue door. You can pick up your order from the box on our front step anytime after 10 am on the date you choose below. *What day would you like to pick up your cake?